Farm Fresh Corn: Sweet Summertime Super Food. 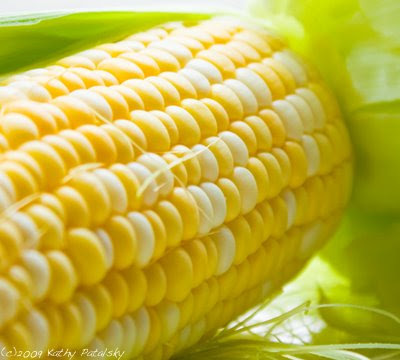 Corn is an excellent source of Folate, Thiamin and Fiber. 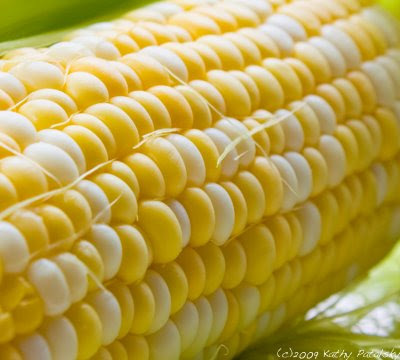 It has a good amount of protein, potassium, phosphorus, magnesium and Vitamin C. Fresh corn is sweet and hydrating. How to choose corn: Look for bright green husks with health silky stalk fibers sticking out the top. You can peel back the husk and check for plump firm juicy kernels. Any wilted or black kernels is a bad sign. A healthy corn will be heavier than an unhealthy corn-more hydrated and healthy. Genetically modified corn has been a big concern in recent years. So, when you can, choose organic corn. Organic corn is always the best choice when available and well-priced. Local farmers market corn is also something to watch for. *In 2005, the U.S. produced 42 percent of the world’s corn. Over 50 percent of the U.S. crop is produced in Iowa, Minnesota, Nebraska or Illinois. *Other world corn producers: China, Brazil, Mexico. *Over 90 percent of the starch Americans used is produced from corn.